The May 2014 Monthly Checklist winners have been announced and the prizes have been rewarded. Congratulations to all of those who have won. Don't forget, this is a monthly permanent feature that you can enter for FREE. If you haven't already, you should start entering the June event! A brand new feature Experiences has just been released in Nimbus. Cornelius loves to sight see. He travels far and wide in his hot air balloon. You wouldn't believe some of the scenery he has seen from up here! Whenever Cornelius experiences a spectacular view, the background will become available for you to find. Once you have found it, you will be able to use this background for your character in the forums. Similar to the way that Hidden Avatars work, you will need to visit somewhere or do something on Marapets related to the 'experience' and unlock it for your collection. You can visit your collection and use it to change your character's background at any time. New backgrounds will be released in the news in the same way that avatars are. The Forums have a new layout for these backgrounds and characters are full sized now, fixing a lot of the clothing that was cut off before. A new 'Desert Night' experience has just been released. Can you find it? The Lottery has been drawn for this week. LMCoy is the winner of the 59,500MP Jackpot with the winning numbers of 2, 7, 5, 9, 1 and 18! Congratulations! Last Week's Raffle has now ended. TashaCatherine is the winner of the Red DNA and 100,000MP prize with the winning raffle ticket number 1498! Congratulations! Make sure you buy your tickets for today's raffle - only 10MP per ticket! The Knutt pet has been revamped. We hope you like the changes! The Knutt can now wear the floral and stone costumes. We have just released a new game, Spooks Busters in Undying Woods. Visiting Undying Woods during the day time can be spooky but spending a night here is simply horrifying. There are 30 different pets sleeping in Undying Woods right now and they have a ghost problem. Who are they going to call? Every bed has a different coloured Spooks hiding underneath. Every 2 hours you can be a Spooks Buster! Click on any of the beds below to scare a spooks away. 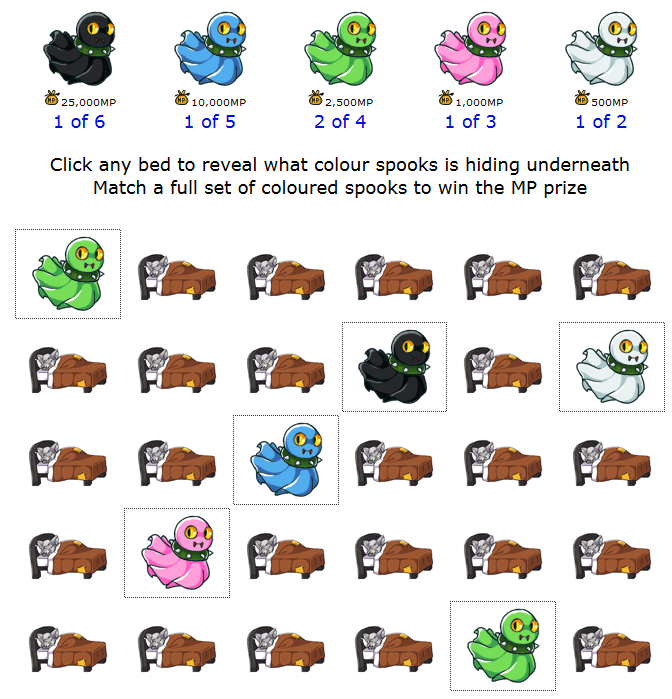 When you scare away a full set of a coloured Spooks you will win the MP prize for FREE. If you are really lucky, you may also win a random pet Poison under any bed! We have just released a new game, Cloud Nine in Nimbus. A visit to cloud nine should put you in a state of blissful happiness. Every 3 hours you can visit to win Free MP. There is a random amount of MP inside each of the nine clouds below. You simply select three of these clouds and the MP will be added to your prize pot. Then, select one of three storm clouds for a multipler amount that will multiply the MP you win in the prize pot. If you are really lucky, you can win up to 100x the prize pot! A new Weekly Item Contest has just started. This week's item is A Bone of Ham, you will need to send this item to the 'Challenge' account. The challenge is to send as many of this item to 'Challenge' this week. The top 3 players at the end of the challenge will receive a Corrupted Giant Carrot, 200,000MP and a Gold Trophy, the next 6 players will receive 150,000MP and a Silver Trophy and the next 9 players will receive 100,000MP and a Bronze Trophy. A new Weekly Battle Contest has just started. This week's opponent is Test Tube, you will need to have a Test Tube Trading Card in your Battle Deck. The challenge is to win as many battles against this opponent this week. The top 3 players at the end of the challenge will receive a Explosive Trading Card, 200,000MP and a Gold Trophy, the next 6 players will receive 150,000MP and a Silver Trophy and the next 9 players will receive 100,000MP and a Bronze Trophy. We have just released a new game, Jackpot Pyramid in Kamilah Desert. The Jackpot Pyramid is one of the Wonders of the Ancient World, with treasure hidden at each level. The higher the pyramid you climb, the higher the treasure you will find. You can visit the Jackpot Pyramid once an hour. Try your luck below and pick one of the squares at the bottom of the pyramid. 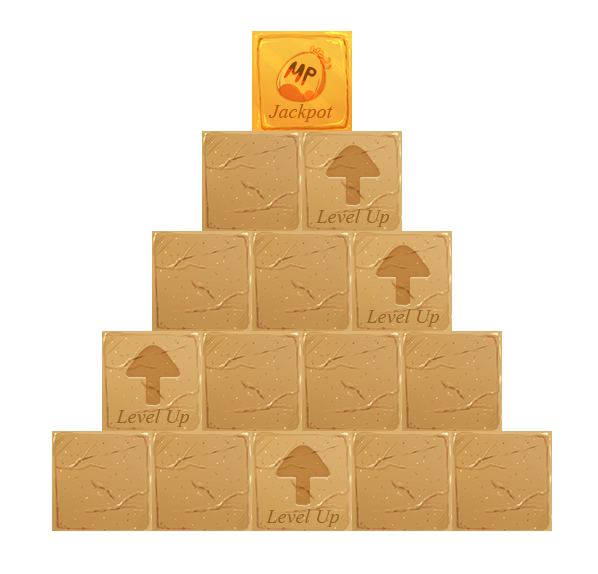 If you find the 'Level Up' square, you will move to the next level of the pyramid. If not, the game is over and you will receive an MP reward. The higher the pyramid you climb, the higher the MP you will be rewarded. The game is FREE to play and the jackpot prize is 25,000MP. If you are really lucky, you may also win a random Kamilah Code item at any level! The Lottery has been drawn for this week. Nokturnus is the winner of the 67,800MP Jackpot with the winning numbers of 15, 7, 3, 4, 5 and 6! Congratulations! Last Week's Raffle has now ended. Naffey is the winner of the Red DNA and 100,000MP prize with the winning raffle ticket number 2474! Congratulations! Make sure you buy your tickets for today's raffle - only 10MP per ticket! We have just released Balloon Burst in Nimbus. Floating high above the clouds of Nimbus is Mango and his balloon collection. He likes to hide prizes inside some of his balloons. You can burst 4 of his balloons for FREE to try and win a prize. Some balloons have MP or items inside, others will allow you to burst more balloons. You may be really lucky and find a Capsule Machine Coin inside! You can play this game once every 3 hours. Back in April 2014, a computer virus infected the city of Ziranek as part of our Ziranek Plot. It quickly spread around Marada, even corrupting the Snowman. Ziranek was upgraded and the virus was traced back to a little toddler Huthiq called Trojan. He was sent back to Enpiah and is never allowed to leave. Trojan needs your help leaving Enpiah! You can play our new Guess the Flag game once every 12 hours. Try and guess the flag of the country that Trojan is trying to visit. If you guess correctly, he will pay you an MP reward. If you are really lucky, he may even reward you with a Shirt of that country for you to wear. There are currently 53 World Clothing shirts available to win, based on the Top 53 countries that Marapets players come from. We will add more countries in the future. A new Weekly Quest Challenge has just started. This week's quest game is Sewer Monster. The challenge is to complete as many of these Quests this week. The top 3 players at the end of the challenge will receive a Elf Costume, 200,000MP and a Gold Trophy, the next 6 players will receive 150,000MP and a Silver Trophy and the next 9 players will receive 100,000MP and a Bronze Trophy. There are 3 new Pet Colours - the Cartoon Zola, Midnight Rusty and Splatter Zola. The Muffin's Bricks flash game now has bonus prizes, meaning that all of our Flash Games now have bonus prizes that you may randomly win when you send a score. The Game of the Day will always give you a free bonus item everytime you play. A new Weekly Item Challenge has just started. This week's item is Triangle Toilet, you will need to send this item to the 'Challenge' account. The challenge is to send as many of this item to 'Challenge' this week. The top 3 players at the end of the challenge will receive a Purple Yolk, 200,000MP and a Gold Trophy, the next 6 players will receive 150,000MP and a Silver Trophy and the next 9 players will receive 100,000MP and a Bronze Trophy. A new Alien Account Upgrade has just been released. The main prize is a new Alien Blaster, currently the strongest attack weapon! You will also receive an alien themed cd, dvd, gumball, stamp, minipet, costume and 2 Trading Cards! All missing Plates have now been released. The Arinya, Dakota, Kaala, Lorius, Phanty, Poera, Tantua and Vixen can now wear the Alien Costume. A new Weekly Battle Challenge has just started. This week's opponent is Rabid Fasoro, you will need to have a Rabid Fasoro Trading Card in your Battle Deck. The challenge is to win as many battles against this opponent this week. The top 3 players at the end of the challenge will receive a Frostbite Trading Card, 200,000MP and a Gold Trophy, the next 6 players will receive 150,000MP and a Silver Trophy and the next 9 players will receive 100,000MP and a Bronze Trophy. Congratulations to our newest Fashion Show Winners - kitten7up, Punk38, xSilverwing and calculus. They each won 100,000MP, the item they helped design and a Fashion Show Medal for their profile. You can now view their entries at the Fashion Show page in Lowlyhood. The items that they helped to design have been added to the Vending Machine. If you have access to the Vending Machine you can now win these new clothing items! The Lottery has been drawn for this week. Carlz2 is the winner of the 42,500MP Jackpot with the winning numbers of 1, 2, 7, 8, 9 and 16! Congratulations! Last Week's Raffle has now ended. Joeker55 is the winner of the Red DNA and 100,000MP prize with the winning raffle ticket number 1714! Congratulations! Make sure you buy your tickets for today's raffle - only 10MP per ticket! This new Floral Costume is now restocking in the Costume Shop. 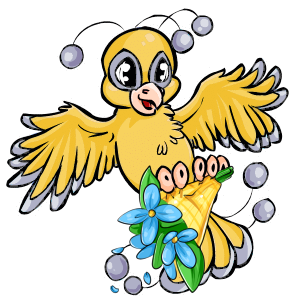 The Lorius, Rusty, Sindi, Willa, Zetlian, Zoosh and Zola are the first pets to be able to wear it. The Costume Shop will now restock the Blue, Red, Yellow, Green, Bronze, Silver, Gold, Brown, Black, Grey, White, Orange, Pink and Purple Costumes more often. The rarity of these items has been lowered. The new Scorpio Treasure Chest has been added to the Account Upgrades Shop. You can open this item to receive 5 random new scorpio themed items, including new clothes, shoes, wig, gourmet food, book, minipet and contact lenses. There are 14 new items avaliable from this Treasure Chest. This item will automatically retire June 16th. The Weekly Item Challenge has just been released. Every Wednesday at 00:00MST a random item that restocks is chosen and a new challenge begins. The challenge is to send as many of this item to the account 'Challenge'. The top 3 players at the end of the challenge will receive a Retired Gourmet Food, 200,000MP and a Gold Trophy, the next 6 players will receive 150,000MP and a Silver Trophy and the next 10 players will receive 100,000MP and a Bronze Trophy. The Weekly Item Challenge has been added to the Puchalla Village map. All 3 of the Weekly Challenge news updates once again show the News alert. A new Weekly Quest Challenge has just started. This week's quest game is Simerian Excavator. The challenge is to complete as many of these Quests this week. The top 3 players at the end of the challenge will receive a Valentine Costume, 200,000MP and a Gold Trophy, the next 6 players will receive 150,000MP and a Silver Trophy and the next 9 players will receive 100,000MP and a Bronze Trophy.